Baron Quick Link, 1/8 in Thick x 1-3/8 in OAL, 3/16 in Jaw Opening, 316 Stainless Steel Baron Quick Link, 3/16 in Thick x 1-7/8 in OAL, 1/4 in Jaw Opening, 316 Stainless Steel, 440 lb Load Capacity Designed for fast, easy connections between two lengths of chain or for attaching accessories to chain. Hex shaped bolt for easy opening. 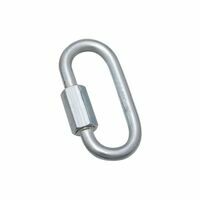 Steel body construction. 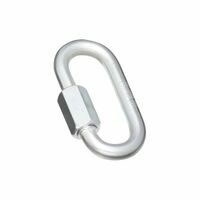 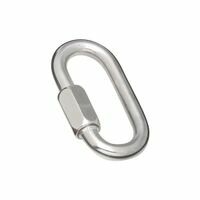 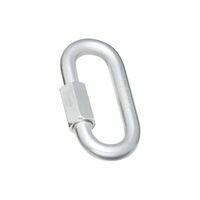 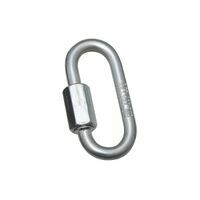 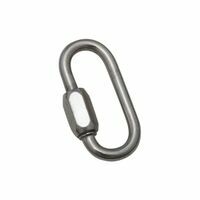 National Hardware Quick Link, Series: 3167BC, 3/8 in, Stainless Steel, 3000 lb Load Capacity, BHMA A138.18, For Marine and Other Outdoor Applications Factory number indicated thickness (inches). Factory number indicated thickness (inches).